Background: Various relevant patents and papers which have reported noncircular gears synthesize the advantages of circular gears and cam mechanisms, and are widely used in many types of mechanical instruments. Hobbing is a better method for fabricating noncircular gears. There are 4 linkagemethods to hob noncircular gears. However, which linkage method should be chosen practically has not yet been reported. Objective: The goal of this work is to choose the best linkage method for hobbing noncircular gears. 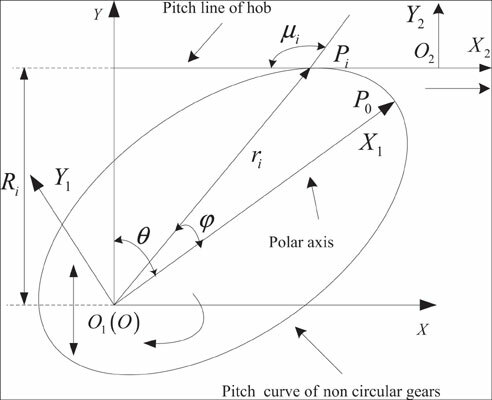 Method: Firstly, the hobbing models of noncircular gears was deduced. Then, based on the model, hobbing linkage methods of noncircular gears were obtained. Thirdly, under different hobbing linkage methods, their aspects (developing regularity of hobbing cutter trace, arc length of program blocks and motion axes of machine tools) were compared. Results: Finally, with the best characteristics of a high density of shaping cutter trace, high uniformity of arc length of program blocks and ease of control, the equal arc-length of gear billet (EALGB) is obtained. It has been proven that EALGB is an excellent linkage method to hob noncircular gears. Conclusion: It has been proven that EALGB is an excellent linkage method to hob noncircular gears. Noncircular gears, hobbing, linkage mathods, hobbing cutter trace, are length of program blocks, motion axes of machine tools.